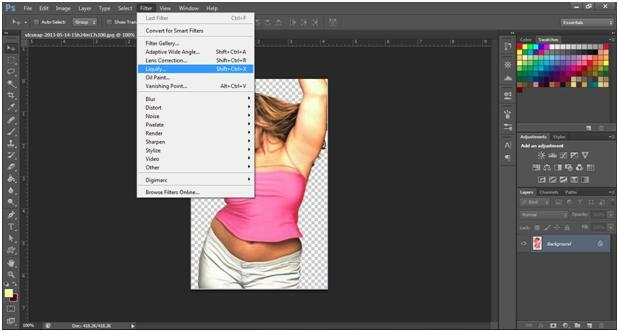 In this tutorial you are going to learn on how to slim down body fat using Photoshop. This does not have any Photoshop version restrictions which means any Photoshop version will do since the whole tutorial is solely based on the Liquify filter. First step is to acquire an image of the one you want to trim off the fat. Open it in Photoshop. If you want, you can download images like these available at different image hosting websites. Be sure that if you want to use the image of photo commercially, you will need to ask permission from the author. Once you have opened the image, open the Liquify by going to Filter – Liquify or you can just use the shortcut keys pressing Ctrl + Shift + X. Start by selecting the pucker tool located at left side of the window, the fourth button from above. Try experimenting with the size of the brush by going to brush size then start clicking on the edges of the image. This will start to ‘slim’ down the edges by bringing it closer to the center. Apply on all sides that needs slimming down. Be careful not to overdo it. You can also use the Forward Warp tool, where you click and drag a certain area and the whole area covered on the brush goes ‘forward’. You will have to control the brush size of this tool so as not to affect the entire photo. The bigger the size of the brush the better your control will be but overall this depends on the kind of image that you have chosen. Below is a shot on how to use the Forward Warp tool. Make it as natural as possible. You can also zoom on specific areas so as to make sure you only have edited a portion and not the whole. Below is the final image. •	Experiment with the Forward Warp tool and the Pucker tool. These are the two basic tools that you are going to need in editing bodies. They can also be used in fattening up bodies too. •	Be careful with images that has backgrounds. If possible, remove the background and bring it out on a new, transparent layer so as not to affect the background during the Liquify session. 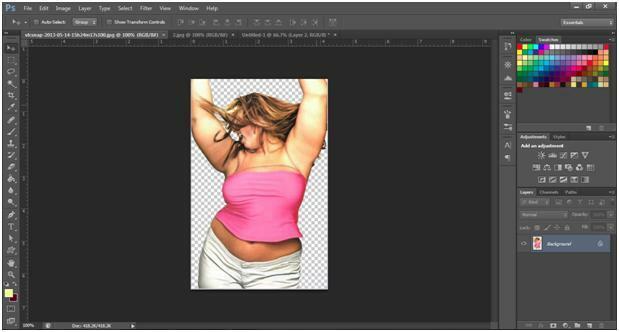 To do this you will need to extract the person you want to edit out of the picture by using the Pen tool. Other editors use the magic wand tool but this is only effective if the background is made of a single color such as white. Pen tool is more effective in extracting a part of the image out of it and place it on another layer. •	Save a backup of the picture that you have edited. Make a .psd copy of the picture that you are going to edit and the original picture untouched from editing. This way you can see the difference from your final editing to the original one.